Five Children And It - E. Nesbit 1902 - T. Fisher Unwin, London - First Edition	A fine first edition of this magical tale bound by Bayntun Riviére of Bath, illustrated by H. R. Millar with forty-six black and white plates – Cyril, Athena, Robert, Jane, and baby brother, Lamb, are exploring the land around the house their parents have rented for the summer when they find the sandpit. They decide to dig a hole straight through to Australia. Their plan is interrupted when Athena discovers a magical creature hiding in the sand. It is a Psammead, and it can grant wishes. Psammead: You're so funny. Have your parents tried boiling you? “Edith Nesbit [1858-1924], was a mischievous, tomboyish child who grew up to be an unconventional adult. She and her husband were founder members of the socialist Fabian Society and their home became a centre for socialist and literary discussion. Their friends included some of the time’s greatest writers and thinkers, including George Bernard Shaw and H. G. Wells. 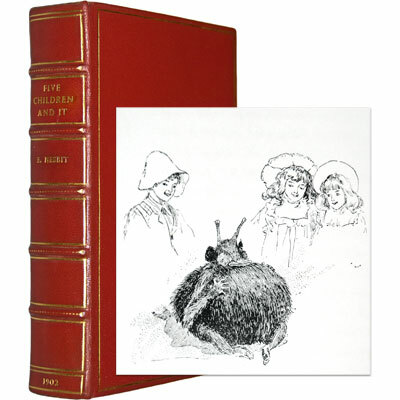 E. Nesbit – she always used the plain initial for her writing and was sometimes thought to be a man – started to write for children after years of successful writing for adult magazines. She was asked to write about her childhood but instead of facts chose to describe her happy girlhood in fiction. The result was books still read today, firm bestsellers for decades. She was brilliant at combining real-life situations with elements of fantasy and humour.” – Heidi Green, William Morrow.